Bison roam outside Yellowstone National Park in Gardiner, Mont., on March 17,2011. Montana’s three-month public bison hunt opened Tuesday Nov. 15, 2011 in areas outside Yellowstone National Park, offering for the first time the opportunity for hunting in Park County’s Gardiner Basin. 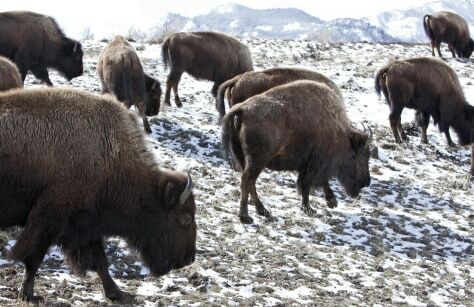 The hunt runs through Feb. 15 and allows for up to 144 bison to be shot.